Fuduntu (despite it's name, it has nothing to do with Ubuntu), a Linux distribution based on Fedora, is now officially a rolling release Linux distribution, meaning you won't have to upgrade / do a clean install each time a new Fuduntu version is released to be able to use the latest software versions. As an example, if you've installed Fuduntu 14.1, you should have Kernel 3.0.1, Chromium 12 and Firefox 6 just like those who are just installing Fuduntu 14.10. Considering the desktop experience, we don't believe it is in the best interest of our users to change their desktop experience just because we can. Rather than spend valuable time reworking another desktop environment to fit Fuduntu, we will simply stay with GNOME 2 for as long as we can. 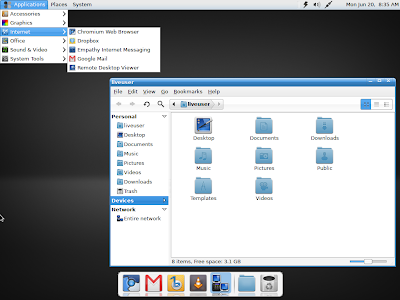 It will be interesting to see how the next Linux Mint or Pinguy OS (both very popular among WebUpd8 readers) will look like: will they use GNOME 2, GNOME Shell, Unity or maybe a classic GNOME 3 desktop?